Texas A&M University-Commerce is committed to the protection of human subjects involved in research and other scholarly activities conducted by our faculty, staff or students. Human Subjects research and other scholarly activities are defined as systematic investigations designed to develop or contribute to generalizable knowledge, which involves the collection of data from or about living human beings. In addition, all student research activities involving human subjects outside of the classroom are considered to be in this category. All research and other scholarly activities involving human subjects are required to be reviewed and approved by Texas A&M University-Commerce’s Institutional Review Board (IRB) prior to initiation of data collection. This requirement applies to all human subjects research and other scholarly activities conducted by faculty, staff, and students, on- and off-campus, regardless of the funding source, if any, for the project. Please contact the Office of Research & Sponsored Programs with questions. 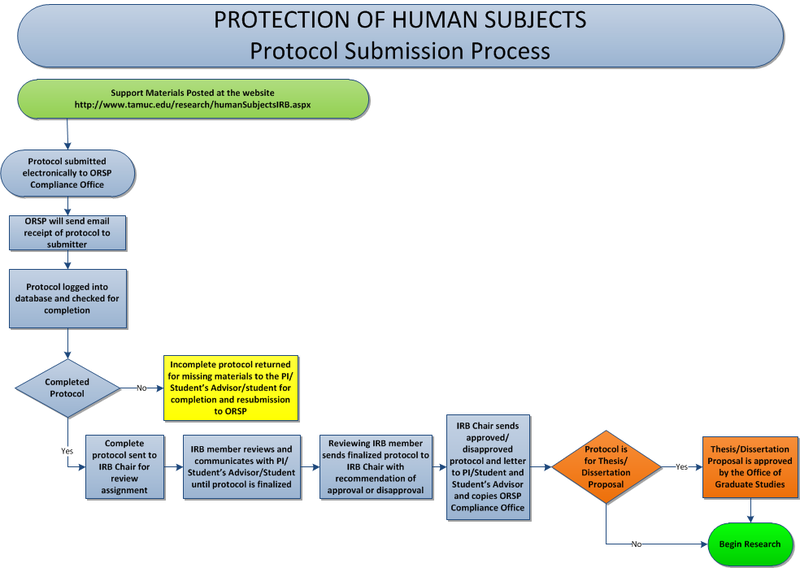 If you are a student, please submit the complete protocol to your adviser to review and submit. Submission to your Departmental IRB for review and the Departmental IRB representative’s signature may be required. If there is no Departmental IRB committee in your department, please submit it to the College IRB committee to review and get the College IRB representative’s signature. If you are a staff/faculty member, please submit the complete protocol to your Departmental IRB to review and get the Departmental IRB representative’s signature. If there is no Departmental IRB committee in your department, please submit it to the College IRB committee to review and get the College IRB representative’s signature. If you are a student from Honors College, please submit complete protocol to your adviser to review and submit. Submission to your adviser’s Departmental IRB to review and get the Departmental IRB representative’s signature may be required. If there is no Departmental IRB committee in your adviser’s department, please submit it to the College IRB committee to review and get the College IRB representative’s signature. Use this form if you are preparing/developing an external grant proposal and need conditional approval. This form must be accompanied by an amendment form. Nuremberg Code - Drafted in 1947 in Nuremberg, Germany after WWII. The Belmont Report - Protects human subjects of biomedical and behavioral research. The Declaration of Helsinki - Ethical principles developed for the medical community to use regarding human experimentation. Adopted in 1964.